We invite educators to request examination copies of titles to be considered for course adoption. Requests should be made on department or school letterhead, with the title of the book to be considered, instructor’s name, course title, course number, and projected enrollment. Please send the request with $5.00 for paperbacks and $10.00 for hardcover books. This nonrefundable charge for shipping and handling per book may be paid by check, money order, or credit card (MasterCard or Visa). 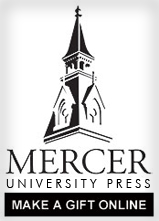 Mercer University Press reserves the right to refuse requests for examination copies.